Yesterday I posted about a tool that you can use to configure TPM on Toshiba machines. 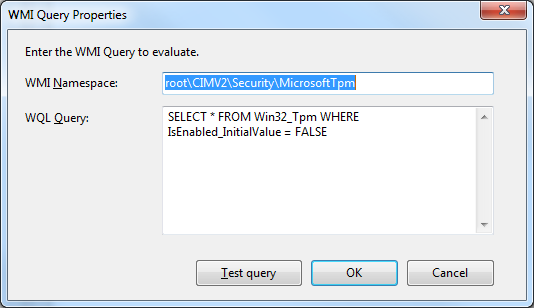 In our task sequence we also check to see if TPM is already enabled and activated and skip running the TPM tool if it is. How? 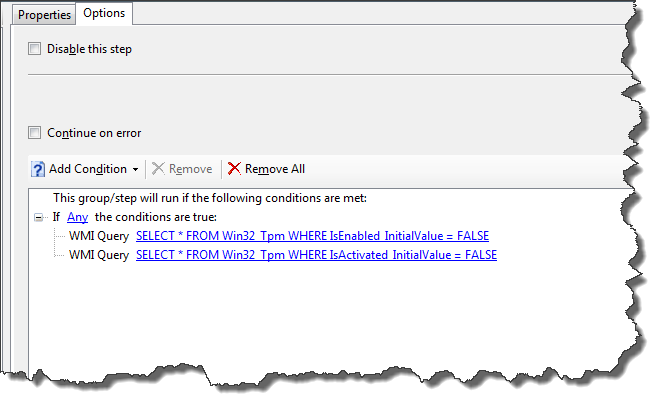 We just have the following two WMI queries as conditions on in the task sequence group where that contains the task sequence action that runs the Toshiba tool. The other task sequence action in this group is a 'Restart Computer' TSA. Is it possible to query to WMI on a Remote Computer for MicrosoftTPM namespace? 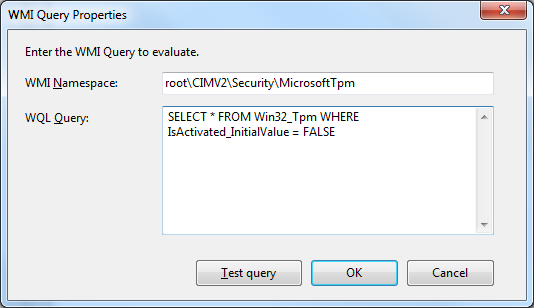 I am trying to query to Win32_Tpm class of WMI from remote machine.but It's failing with HRESULT 0x80041013 & Description: Provider load failure. I have posted the code, http://stackoverflow.com/questions/29102114/is-it-possible-to-query-to-wmi-on-a-remote-computer-for-microsofttpm-namespace. Please take look at it, and let me know if remote query to it is possible.